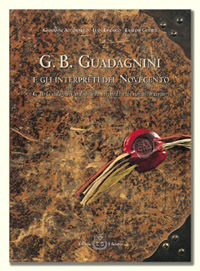 A book dedicated to Giovanni Battista Guadagnini. A new work from Edizioni Il Salabue containing much that will be of undoubted interest for violin makers, collectors, dealers and enthusiasts. At "Edizioni Il Salabue" we had long intended to enrich our catalogue by dedicating a book to the great violin maker from Piacenza, but to propose something different from the contributions and monographs currently available. Not least because Duane Rosengard's work had filled many of the gaps in our knowledge. We thus decided to follow an unusual approach in the new work, while still covering Guadagnini's entire life and career. Rosengard himself has summed up the results of his research in the biographical notes, providing interesting additions not previously published; Andreas Hellinge has concentrated on the construction details of Guadagnini's five stylistic periods, corresponding to his periods in Piacenza, Milan, Cremona, Parma and Turin. And Hellinge offers a new theory, showing that Guadagnini may properly be considered a direct heir of the great Cremona school, above all with regard to the time when he was in contact with Count Cozio. This is followed by the images of five instruments, built in the five different periods, and each with a technical description prepared by an international expert: Jean Jacques Rampal, Roland Baumgartner, Charles Beare, Peter Biddulph and Philip J. Kass. Twenty rare twentieth-century instruments follow, built to Guadagnini models or as "copies" by twentieth-century maestros, including Annibale Fagnola, Carlo Giuseppe Oddone, Evasio Emilio Guerra, Leandro Bisiach, Giuseppe Ornati, Celeste Farotti and many others. Each instrument is presented with a technical descriptions by a well-known professional of the sector, followed by four pages dedicated to each violin, with life-size photographs of details. But the originals of these instruments have not been overlooked: they are included to enable comparisons to be made that help to understand where the original has been rigorously respected and where interpretation has taken freer reign: it is just from this interesting comparison that the essence of Giovanni Battista Guadagnini's work emerges. Through this complex editorial operation we aimed to point out that the twentieth century did not limit itself to Stradivari or Guarneri del Gesù as reference violin makers, but that also Guadagnini was an important source of inspiration. The work closes with comparative tables of the heads and tables with all the basic measurements.